Corn potato kebabs are is a lovely snack recipe which can be prepared anytime but generally these are deep fried. To avoid oil, we have prepared corn potato kebabs in LG convection microwave oven at the charcoal mode. The result was crisp kebabs with soft interior. Yummy yummy..
1. Mash potato and add all ingredients well. Make oblong shape kebabs and place these on multipurpose plate/try of microwave. Place the plate on high rack in microwave. Set the Charcoal mode for making corn kebabs at menu no. 14. Once beeped, keep the corn kebabs for another 9 minutes. 2. Once the surface of corn kebab is crisp, remove the corn kebabs from the plate and serve hot with ketchup or chutney of choice. So tasty recipe you share in here and i know there are more people are like to eat such kind of food. I mean microwave technology makes our life so more easy and we can make so more item in our home in a short time. Hey, your recipe is delectable and I am definitely going to try this. 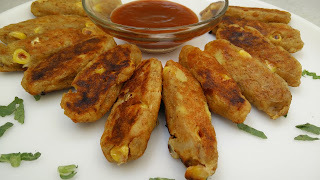 You must add one more mouth watering Thai Corn Fritters recipe to your list that I tried yesterday.